On Saturday, Princess Marie-Gabrielle, oldest child of Prince Jean, and Antonius Willms will celebrate their religious wedding in Marbella, Spain. The couple already had their civil wedding in Luxembourg earlier this year. In a small interview to the online edition of Hola, the princess revealed some details about the upcoming nuptials. The bride will exclusively wear Spanish designers for all the celebrations surrounding her wedding, namely Lorenzo Caprile, Roberto Diz and Pedro del Hierro. Among the 270 guests will also be her aunt and uncle, Grand Duke Henri and Grand Duchess Maria Teresa, as well as their five children and daughters-in-law. Archduke Christoph, son of Luxembourg's Princess Marie-Astrid, and his wife Archduchess Adélaïde recently welcomed their second child. The baby girl named Sophia joins a big sister Katarina, who was born in December 2014, in the family home. Archduchess Sophia is the 11th great-grandchild of Grand Duke Jean. 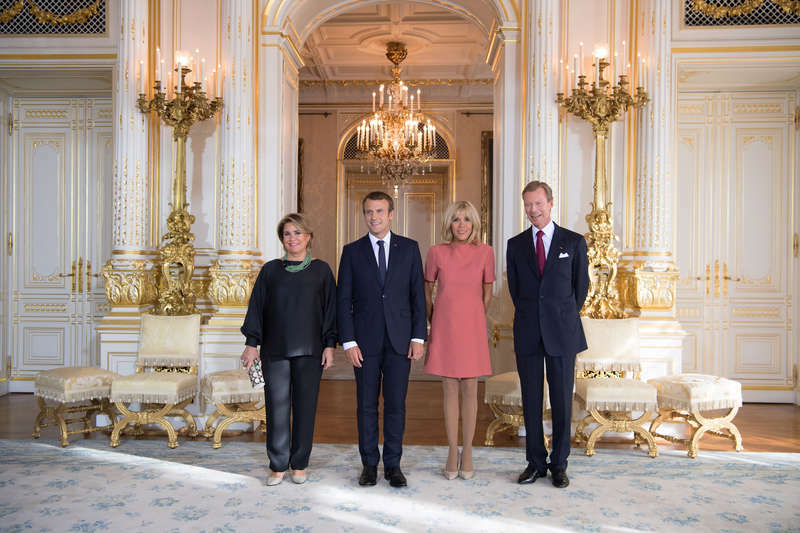 On the 29th, Grand Duke Henri and Grand Duchess Maria Teresa received in audience President and Mrs. Macron during their visit to Luxembourg. Following the audience, the President and his wife visited the Abbaye de Neumünster and the Musée d’Art moderne Grand-Duc Jean (Mudam), along with Amélie Derbaudrenghien (partner of the Prime Minister of Belgium) and Gauthier Destenay (husband of Luxembourg's Prime Minister Bettel). Some more photos at the Cour website. Prince Nikolaus and Princess Margaretha are currently on a visit to Slovenia. The brother of the Prince of Liechtenstein and the sister of the Grand Duke of Luxembourg arrived in Celje today where they were greeted by the local mayor, the leadership of the municipality and knights of the Order of St George from Carantania. The aim of the couple's visit is to further strengthen the ties between Slovenia and Liechtenstein. Prince Nikolaus and Princess Margaretha will stay in the country for another day with a gala dinner hosted by the Slovenian-Liechtenstein Friendship Association taking place this evening. For more pictures and a little more information (in Slovenian), have a look here. On the 22nd, Hereditary Prince Alois received at Vaduz Castle a delegation of Congressional staff members who arrived in Liechtenstein at the invitation of Minister of Foreign Affairs Aurelia Frick. During the visit, they met with a number of officials and also engaged in discussion about the bilateral relations between Liechtenstein and the United States. Among the important topics were foreign policy and tax reforms that might affect Liechtenstein businesses in the United States. Liechtenstein has maintained an embassy in Washington, D.C. since October of 2002. Shortly before National Day in Liechtenstein, Prince Hans-Adam gave an interview from where he was visiting in Kalwang (within Styria, Austria). He discussed his own personal and family history of visiting Styria and the many good memories that it holds for the Princely family. The interviewer also talked about the Prince's business interests in Styria and abroad, and the Prince talked about how he has divided the different family responsibilities among his sons: state, banking, and land/business. On a personal note, Prince Hans-Adam noted that in his youth he had expressed to his family a desire to study physics but that his rather pointed out "Hans-Adam, we cannot afford that. You have to study economics and law: economics to rebuild the fortune, and law because I want to give you the office of the head of state." The Prince has retained a love for physics, as well as archeology, as hobbies, just as his father studied mathematics as a personal interest. The interview also touched on the Princely family's art collections and the Prince's own hard work to rebuild the family's financial standing (in part to continue the history of building the art collection). 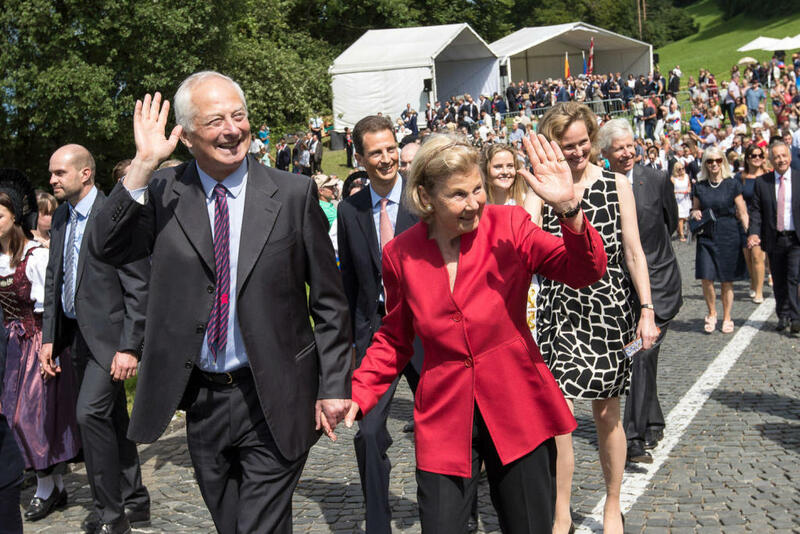 In response to the question about a "secret to success," Prince Hans-Adam highlighted the importance of the Princely family's closeness to the people of Liechtenstein, as well as their own commitment to paying privately for the monarchy. He offered the reminder that the state is a provider of services and that the people have the right to decide if the state is sufficiently accomplishing that requirement. C’est avec stupeur que la Grande-Duchesse et moi-même avons appris la nouvelle des différentes attaques meurtrières en Espagne hier, notamment sur le boulevard des Ramblas à Barcelone. Il nous tient à cœur de vous exprimer, au nom de tous nos compatriotes et en notre nom personnel notre profonde compassion et notre solidarité. Dans ce temps de deuil, je vous prie de vous faire l’interprète de notre profonde émotion auprès des victimes, leurs familles et du peuple espagnol tout entier. Soyez assuré de notre solidarité inconditionnelle dans la défense de nos valeurs communes face à la violence aveugle. It was with astonishment that the Grand Duchess and I learned the news of the various murderous attacks in Spain yesterday, notably on the Boulevard des Ramblas in Barcelona. We are committed to expressing our deepest compassion and solidarity on behalf of all our compatriots and on our own behalf. In this time of mourning, I ask you to express our deep emotion with the victims, their families and the entire Spanish people. Rest assured of our unconditional solidarity in defending our common values ​​in the face of indiscriminate violence. After the official ceremony of Liechtenstein's National Day, the locals were able to mingle with the Princely family at the fun fair, which included a variety of performances and plenty of food. This is traditionally held in the afternoon and evening. 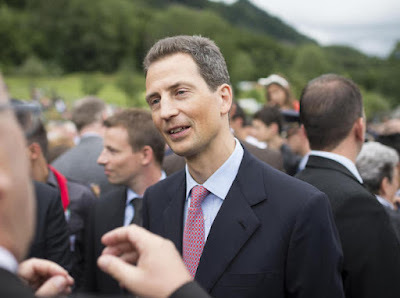 Hereditary Prince Alois, in particular, gave another interview and also reached out to meet with the attendees and discuss some of the more pressing issues that face Liechtenstein society. Among these issues are the need for reforms in the care of the aging members of the population, as well as the current health care and nursing care of the country. Additionally, he commented on future economic opportunities, both domestic and international, for businesses in Liechtenstein. Other family members were extremely likely there as well but just not spotted by the photographers (as far as we've seen). The evening was rounded off by the traditional fireworks and torchlight display. More photos at Vaterland, and more about the Hereditary Prince's comments here. As always, pictures of the day are slightly hard to come by but we will do our best (with further updates to come). 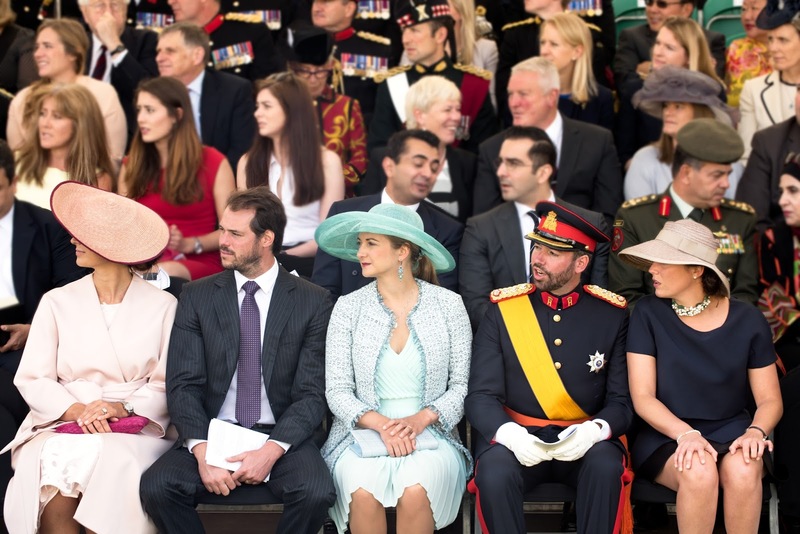 Thus far, we could spy Prince Hans-Adam II, Princess Marie, Hereditary Prince Alois, Hereditary Princess Sophie, Princess Marie-Caroline, and Prince Nikolaus (Hans-Adam's brother) all in attendance. Other family members might also have been present, so we'll update as soon as we know more. Traditionally, the first part of the celebration, the state ceremony, was held on the castle meadow next to Schloss Vaduz. During the course of the act of state, both the president of the parliament as well as the Hereditary Prince, who is his father's regent, held speeches. This year, Hereditary Prince Alois focused his speech on the matters of an evolving population that reflects migration, as well as the realities of an increasingly digital world. For more about the speech, see here. After the end of the state ceremony, the Princely Family made their way into the rose garden of Schloss Vaduz, where the traditional reception took place. This year, however, it was the first time that access to the garden was limited. Tickets were supplied in advance with the reason being that the reception had been so crowded during recent years that regular Liechtensteiners hardly had a chance to speak to their Fürst and his family due to many foreigners also trying to meet the royals. Some photos from Vaterland here and here. UPDATE: Photos from Volksblatt here. 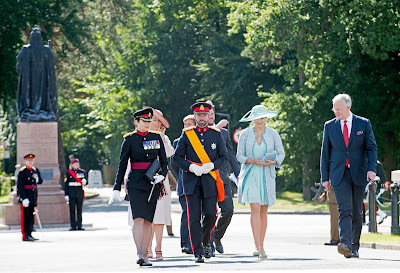 The Cour has released more photos of Prince Sébastien's graduation from Sandhurst, which occurred on August 11th. King Abdullah II of Jordan was also there to review the troops, as his son Crown Prince Hussein was also among the graduates. 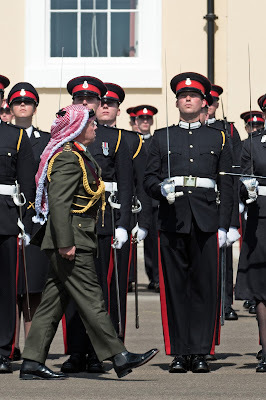 King Abdullah also spoke at the ceremony, commenting on his own time at Sandhurst, congratulating the graduates on their achievements, and reminding them of the importance of good leadership in their future military roles. 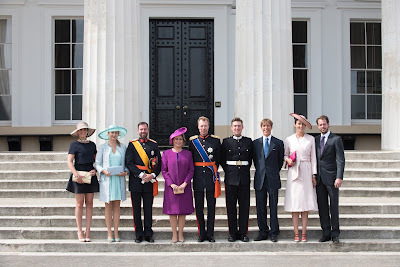 Several members of the Grand Ducal Family were present for his Passing Out Parade (or Sovereign's Parade): Grand Duke Henri, Grand Duchess Maria Teresa, Hereditary Grand Duke Guillaume, Hereditary Grand Duchess Stéphanie, Prince Félix, Princess Claire, Prince Louis, and Princess Alexandra. 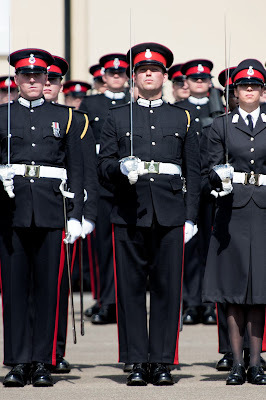 Prince Sébastien carries on a tradition of Sandhurst training: Grand Duke Jean graduated from Sandhurst in 1943, Grand Duke Henri graduated in 1975, and Hereditary Grand Duke Guillaume graduated in 2002. 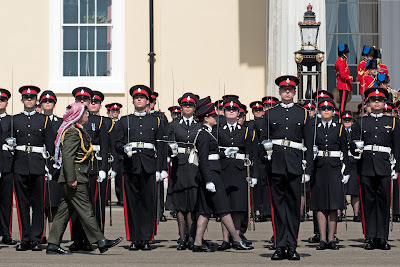 Following the Passing Out Parade, the graduates joined the attendees for a lunch at Old College Square. UPDATE: A video is now available from RTL. 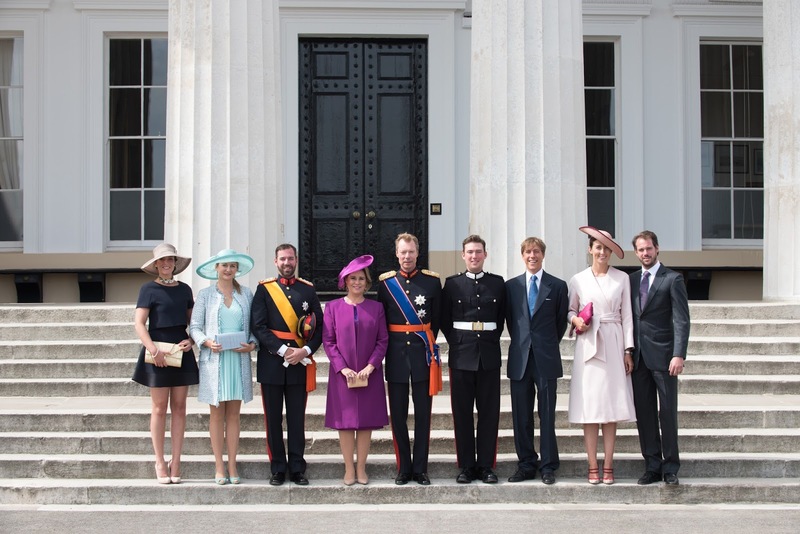 Grand Duke Henri and Grand Duchess Maria Teresa, Hereditary Grand Duke Guillaume and Hereditary Grand Duchess Stéphanie, Prince Félix and Princess Claire, Prince Louis as well as Princess Alexandra were all there to support the youngest in the family on his big day. Unfortunately, we aren't very blessed with visuals of the event. We tried holding out until publishing this post until pictures of the new officer become available but they haven't yet. Here's hoping the cour will release some official pictures. 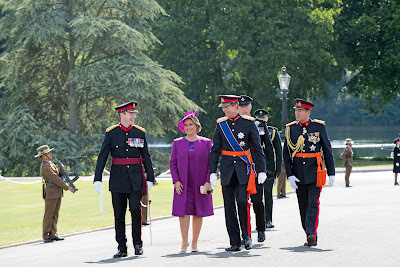 No word either on what Prince Sébastien will do next, though he could now join the Luxembourgish army full-time as he has been commissioned into Sandhurst on behalf of Luxembourg. 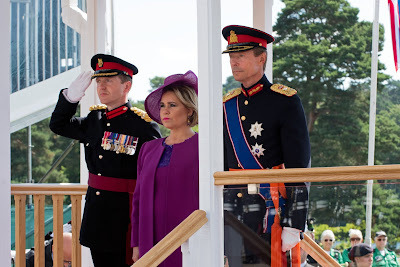 No doubt we will see him for the first time in Luxembourgish uniform on next year's national day (provided he attends). In the meantime, check out some more photos at Getty Images. 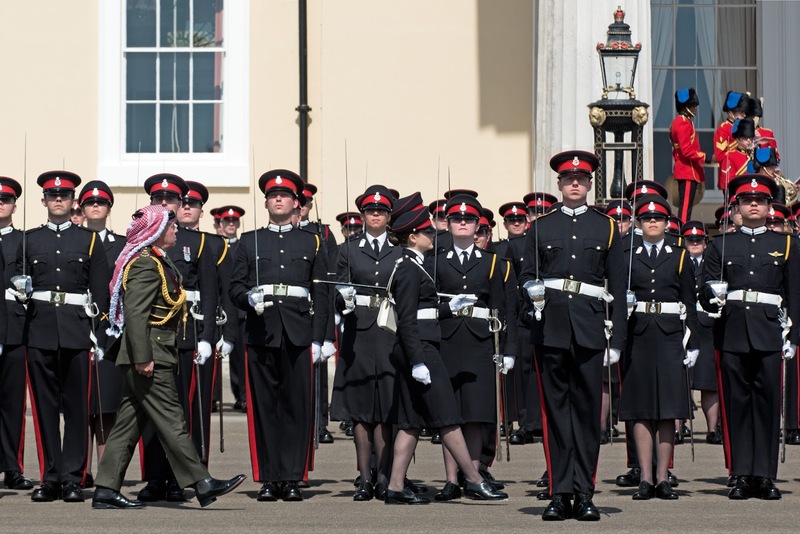 By the way, Prince Sébastien wasn't the only royal to complete Britain's prestigious military academy today. Also in his course were Crown Prince Hussein of Jordan as well as Prince Wenzel of Liechtenstein, third child and oldest son of Prince Gundakar and his wife née Princess Marie of Orléans. Princess Irmingard of Bavaria (1923-2010) was the second child and eldest daughter of Crown Prince Rupprecht of Bavaria (1869-1955) and his second wife Crown Princess Antonia (1899-1954, born a Princess of Luxembourg). She was born in 1923 in Berchtesgarden Castle, the residence of the Crown Princely family. Princess Irmingard's autobiography was published in 2000. She describes the first 27 years of her life, starting with her birth and ending with her marriage to Prince Ludwig of Bavaria, her first cousin. Born into a former ruling family, Irmingard and her siblings enjoyed a free and happy family life, nevertheless with the knowledge of her family's past and of being "special" in her role as a princess. They didn't attend state schools but had private tutors and also weren't allowed to play with every child in the neighbouring villages. The tutors and the family's priest decided with whom the crown princely children should play. The crown princely family spent their time in Schloss Berchtesgarden until 1929. After that they divided the time between their winter residence in Munich, the so-called Leuchtenberg-Palais, and their summer residence Schloss Hohenschwangau in Schwangau (best known as one of the childhood homes of King Ludwig II). From 1933 onwards the family lived in Schloss Leutstetten. Most of the time they spent their summer holidays in Luxembourg at Château de Berg and Bavaria at Schloss Hohenburg, the residences of Dowager Grand Duchess Maria-Ana, Irmingard's grandmother. Irmingard describes a get-together of the extended Grand-Ducal family which means the families of Aunt Lotti (Grand Duchess Charlotte) and her sisters Hilda, Antonia, Sophie and Elisabeth. She also tells her readers how the family regularly remembered Aunt Maus (mouse), the late Grand Duchess Marie-Adelaide and how the children played with each other. Her cousin Johany/Johnny is described especially well by Irmingard. Later he became Grand Duke Jean. Times changed and became tougher when Adolf Hitler came to power. This was the reason why the family left Munich and moved to Leutstetten. Crown Prince Rupprecht was an opponent of the new regime and so the family had to deal with many difficulties. Between 1936 and 1939 Irmingard, her sister Editha and two of her Luxembourgish cousins Elisabeth and Marie Adelheid went to "Sacré Coeur" a boarding school in England. A year later her two younger sisters Hilda and Gabrielle followed. The families hoped to protect the girls, and Grand Duchess Charlotte and Crown Princess Antonia accompanied the girls in the first few days. At "Sacré Coeur" Irmingard had some famous classmates: Joan and Patricia Kennedy, as well as Benedikta and Maria Adelgunde of Hohenzollern ("Mädi and Mimi" in the book). During this time Irmingard, her sisters, and cousins were invited to meet Queen Mary. With the start of World War II an odyssey started. The family spent the summer of 1939 in Luxembourg, and after that the girls moved to Brussels to enter another "Sacré Coeur" school. There they also met with Empress Zita of Austria and her children, who spent part of their exile in Steenokkerzeel near Brussels. The family returned to Munich but left the city shortly afterwards to live in Italy. King Vittorio Emanuele helped the family to flee by sending his private saloon car. In Italy the family spent some time in Rome where Prince Heinrich went into hiding, Florence where Crown Prince Rupprecht went into hiding as well as in Padua and Brixen. After an assassination attempt on Hitler failed, the Gestapo (the Nazi's secret police) imprisoned Crown Princess Antonia and the rest of her children except of Irmingard who stayed with family friends during this time. Crown Princess Antonia was sent to a hospital in Innsbruck while her children were brought to the concentration camp Sachsenhausen. Later Princess Irmingard was also caught by the Gestapo and sent to Innsbruck as well because of typhus. There she met her mother. After their recovery they were sent into concentration camps as well, Irmingard to Sachsenhausen and Antonia was brought to Weimar. From Sachsenhausen Irmingard and her siblings were sent to Flossenbürg and later to Dachau. During this time the siblings didn't know about their parents' destiny. In April 1945 they were liberated by American soldiers and sent back to Schloss Leutstetten. Princess Irmingard describes this horror very personally and emphatically. The despair of not knowing if and how to survive the next day is supported by various paintings by Irmingard, which she painted during and after her stay in the concentration camps. These paintings can also be seen at the "Museum der bayerischen Könige" in Schwangau. After the war was over Irmingard was sent to the USA for recovery. Her sister Hilda married in Peru, and she was the only family member who took part in this wedding. The book ends with a detailed description of her father's 80th birthday celebrations, Irmingard's own wedding and the death of her mother. In her autobiography Irmingard of Bavaria gives a lively description of her family life in a time of unrest. She shows how close the extended Grand Ducal and Crown Princely family were and how they managed to stay in contact throughout the years. Her book includes many private family pictures, most of them never released before. It is a recommendation for everyone who is interested in the history of the houses of Wittelsbach and Nassau/Luxembourg from a more personal point of view. Have you ever felt like you have opened a can of worms? That you said something you shouldn't have? That you made a thoughtless comment in the spur of a moment that you later regretted? That's what happened to me the other day. Without thinking much, I said something about a significant other of one of the people we cover on this blog. This significant other wasn't generally known before the comment I made and with the information I provided, fellow royal watchers took it upon themselves to dig for further information and were successful. Since then the name of a private individual who just happens to be close to someone with a famous family name has been floating around the internet with some people even feeling the need to make more or less appropriate comments as well as publish further information. Some will say: That's the price of dating royalty - but it shouldn't be. Of course there are occasionally cases, where the individual might want to get things out there, essentially negating the need for privacy. But that certainly wasn't the case here. The person in question and their significant other have never appeared together at a public event much less being photographed together or have officially spoken about each other. So why the need to basically throw them to the wolves in a day and age where something that is once written in a public space on the internet will never again fully disappear? For hits? To prove that you know something others don't? I am certainly not faultless in all of it and I regret making a - what I thought at the time - fairly innocent and - as it turns out - thoughtless comment about the nationality and family heritage of the person in question which led to their identity being revealed to the broad public. And even though they will very certainly never read this: My sincere apologies to everyone involved! I have certainly learned my lesson and will not make the same mistake again. I know that we haven't always been as strict here at Luxarazzi, but it will definitely mean that we will become even more strict and careful than we are now about extra bits of information we mention here and there about members of both the Luxembourg and Liechtenstein families. Yes, royals are public figures, but in no way does that make it acceptable to intrude on their private life. They deserve the same respect and common courtesy that we all do. The very same goes for royal adjacent people, people that may not even have the same resources to protect themselves in a way that a royal would. Just because something is theoretically available online, doesn't mean it should be widely shared. I very much understand that for a royal watcher, that kind of detail is tempting and may serve the purpose of establishing credibility to show that you know something others are not aware of. But your need to establish and promote yourself should not hurt another person who is just thrown under the bus in the process of doing so. Treat them as you would want to be treated. We are dealing with human beings and the human aspect of it, like how the people in question might feel, should always be our first concern - the number of hits your website gets or the number of likes your post on social media shouldn't. Recently a conference entitled L'avenir d'Europe (The Future of Europe) took place at the Château de Belœil in Belgium, home of the Prince and Princess of Ligne. The Prince of Ligne, of course, is the son of Princess Alix of Luxembourg, younger sister of Grand Duke Jean. Among the guests for the conference, which included President of the European Commission Jean-Claude Juncker as its speaker, was Prince Jean. This week's edition of Point de Vue features an article about newlyweds Princess Marie-Gabrielle of Nassau and Antonius Willms. The only daughter of Prince Jean and his first wife Hélène Vestur and her husband married civilly in Luxembourg in May of this year. Their religious wedding is to take place in Marbella, Spain, on September 2 at the Iglesia del Santo Cristo. In addition to information about the couple, how they met and how they live in Munich, Germany, the article also features a bunch of lovely photos of the couple. Definetely worth to check out! What a lovely surprise! 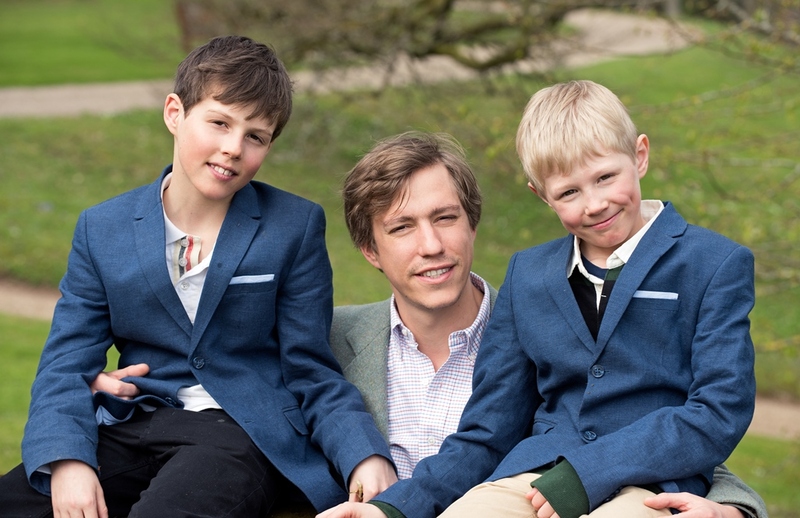 The cour grand-ducale has released a new photo of Prince Louis and his sons, Princes Gabriel and Noah. Judging by their clothes and the green-ness (as in colour) of the trees in the background (or lack thereof), I'm guessing the picture was taken sometime this spring. The photo was released to mark Prince Louis' birthday. The Grand Duke's and Grand Duchess' third child turns 31 on Thursday this week. 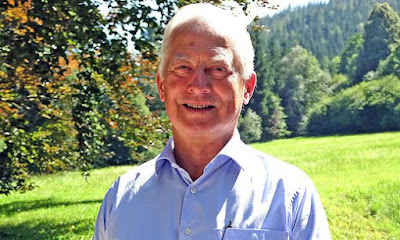 On the 27th, Prince Nikolaus was in Schrun, Austria, to attend a service marking the "Signs of Connectedness" in honor of the founder of the Pan-European Union. On the 27th of July in 1972, Richard Nikolaus Coudenhove-Kalergi passed away in Schrun, and this 45th anniversary memorial event was particularly focused on the recognition of a merging of cultures and embracing of refugees. The memorial service also included the blessing of a fountain by Cardinal Christoph Schönborn. The service was held at the church of St. Jodok, and attendees included President of the National Council, Karlheinz Kopf, and President of the State Parliament, Harald Sonderegger, along with local Mayor Jürgen Kuster. Prince Nikolaus spoke at the event. A little more information here. No photos at present, but they'll be added if any are made available.